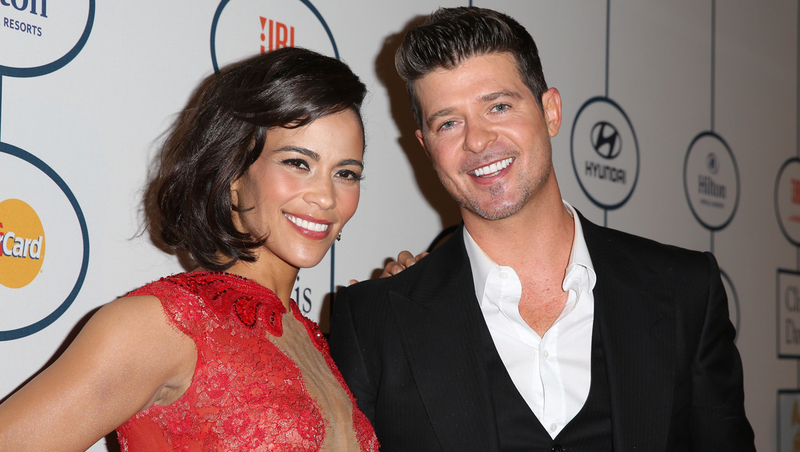 Singer Robin Thicke and actress Paula Patton may be kaput, but that doesn't mean there isn't love between the former couple. The couple announced they were separating earlier this year after nine years of marriage. At the time, Thicke had publicly said he was trying to get Patton back. But now Patton is doing the talking, telling Vanity Fair, "We've known each other since we were teenagers. All I can tell you is there's a deep love there -- always was, and always will be." Patton, 38, and Thicke, 37, met when they were teenagers and married in 2005. They welcomed a son, Julian Fuego Thicke, in 2010. "He wasn't my first kiss," Patton said. "But he was my first lots of other things." Patton has appeared in Thicke's music videos, including "Lost Without U" and "Love After War." She was the inspiration behind some of his songs, and also graced the cover of his 2003 debut, "A Beautiful World." Patton has been in Vancouver filming "Warcraft," which is based on the popular online game series. "I've never been big into video games," Patton told Vanity Fair. "But the Warcraft script reads more like a complex, epic novel." Thicke, meanwhile, has scattered tour dates lined up throughout the summer. Policy was at the forefront for five 2020 Democratic presidential candidates in televised town halls Tuesday night, but each also weighed in on whether Congress should impeach President Trump. Sean Sullivan and Ed O'Keefe discussed their takeaways on CBSN's "Red & Blue."